Look, we’re not going to beat around the bush. If you’re in the market for a new tablet there are really only two kinds you should consider, unless you need it for work. The first is obviously Apple’s iPad lineup, which continues to be the best after all these years. The second is Amazon’s Fire tablet lineup, which offers the perfect balance of affordability and flexibility along with a terrific user experience. The Fire 7 is one of the most popular tablets Amazon has ever released, and we’ve got a terrific deal for you to check out. Between now and the end of the day on Saturday, use the exclusive promo code BGRFIRE7 and you’ll save $20 on the All-New Fire 7 Essentials Bundle, which includes an Amazon cover and a screen protector. That drops the price to just $52.97, which is the lowest it has ever been. 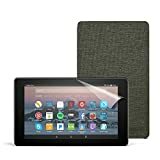 Includes the latest Fire 7 Tablet with Special Offers, 8GB, Black ($49.99), Amazon Cover, Charcoal Black ($24.99), and Nupro Screen Protector, Clear ($12.99).